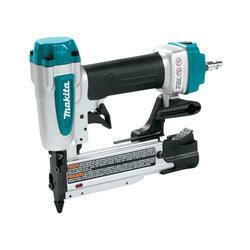 We are a leading Manufacturer of makita nailers & staplers from Bengaluru, India. Push button air blower cleans dust and debris from work material. Double trigger maximizes operator safety by preventing accidental trigger engagement. High visibility slim nose tip enables precision nail positioning. Anti-dry fire mechanism prevents added wear on drive pin. Nail view window enables fast identification of remaining nail capacity. Protective rubber bumpers guard housing against wear and damage. Soft rubber anti-slip ribbed grip for vibration absorption and comfortable operation. Anti-dry fire mechanism prevents excessive drive pin wear. Nail view window for fast identification of remaining nail capacity. Protective rubber bumpers minimize housing wear and damage. Soft rubber anti-slip ribbed grip provides vibration absorption and comfortable operation. Looking for Nailers & Staplers ?